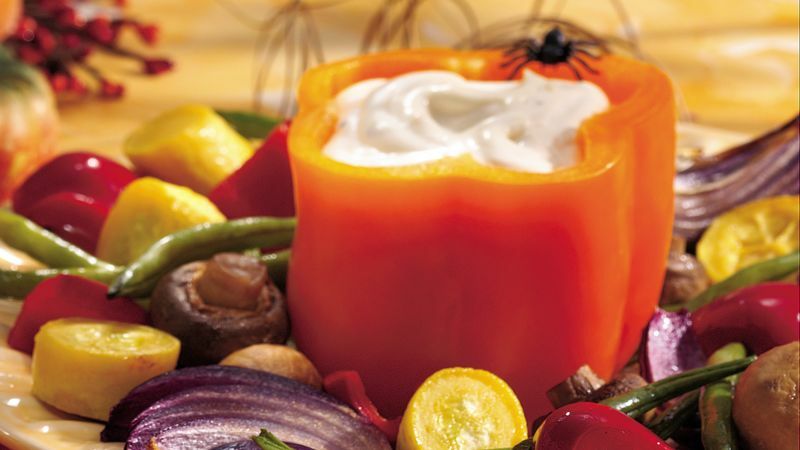 In small bowl, combine all dip ingredients except orange bell pepper; mix well. Refrigerate at least 30 minutes to blend flavors. Cut 1/2 inch from stem end of orange bell pepper; remove seeds and veins. Spoon dip into bell pepper. Meanwhile, heat oven to 450°F. In large bowl, combine all vegetables with oil; toss to coat evenly. Arrange vegetables in ungreased 13x9-inch pan. Bake at 450°F. for 15 to 20 minutes or until crisp-tender. Serve warm vegetables with dip, or refrigerate vegetables for at least 8 hours or overnight before serving with cold dip.